I'm a software engineer in Shanghai, China, and since I bought a Raspberry Pi, I spent some spare time on it and I'm glad to share something with Pi users all over the world, so this article has two languages: Chinese & English, and I try to translate the Chinese to English as accurately as possible, but, there might be some translation mistakes, so if you don't know what I mean in the article, just leave a comment, and I'll reply when I get an answer. Also welcome to contact me via Email. The Raspberry Pi is a credit card sized single-board computer developed in the UK by the Raspberry Pi Foundation with the intention of stimulating the teaching of basic computer science in schools. In short, Pi is an ARM-based mini computer which has a credit card size. Before reading this article, I recommend you to read another one on Pi configuration because this article has some connection with it. 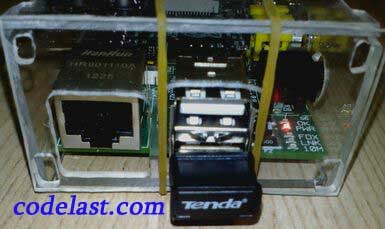 To get rid of the inconveniency of connecting a network cable to Raspberry Pi I decided to equip it with a wireless USB adapter. 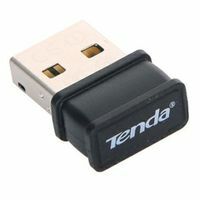 After Googling the Internet I found that many Pi users mention the wireless USB adapter based on Ralink RT5370 chipset, so I bought one too - the Tenda W311MI 150Mbps Wireless Mini USB Adapter(shown as below), which based on RT5370 and has a very low price: only $4.8 . It's hard to find a detailed tutorial on how to use a RT5370-chipset-based wireless USB adapter on Raspberry Pi which runs the Arch Linux ARM os(but there are some good tutorials on Debian), so I wasted a lot of time in the setup process and when I figured it out I decided to write them down. So be sure again that if you are running the Arch Linux ARM on Pi and using a wireless USB adapter which based on RT5370 chipset, then you'll read something useful in this article, if not, don't waste your time and just close this webpage. This page is the official driver download page, but we don't need it in the whole setup process because Arch Linux ARM has it installed already. So the Ralink RT5370 chipset has been recognized and this is the first step to success. According to this article, the rt2x00 is the uniform driver for Ralink chipsets. The "wlan0" is what you should focus on. So we just use it. If you can't find the package, it's very easy to use pacman to install it. The "myWirelessSSID" is the SSID of your wireless network, "myPassword" is the password used to connect the network. wpa_passphrase tool will generate a very simple configuration file according to the info you provided and here we write the output to file /etc/wpa_supplicant/wpa_supplicant.conf. Now Pi should be able to connect the wireless network. You can refer to this article, item 【2】 on how to execute shell command on startup. So the main purpose of this article has been reached. If you want to know more about Pi, please read these articles.